We’d love your help. 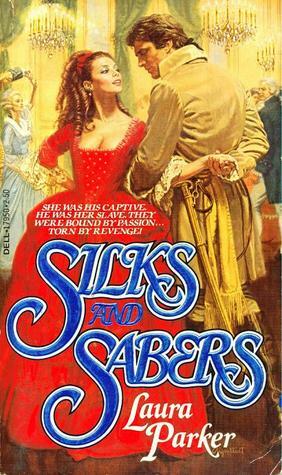 Let us know what’s wrong with this preview of Silks and Sabers by Laura Parker. He had saved her life. She owed him everything. But Gweneth Valois swore she would rather be savaged by pirates than rescued by Captain Raoul Bertrand, the man who had killed her brother, captured her sister, and expected Gweneth to pay her debt - with gratitude. Had she escaped the terrors of the Revolution oly to be trapped in hell on the high seas? From war-torn France t He had saved her life. She owed him everything. But Gweneth Valois swore she would rather be savaged by pirates than rescued by Captain Raoul Bertrand, the man who had killed her brother, captured her sister, and expected Gweneth to pay her debt - with gratitude. Had she escaped the terrors of the Revolution oly to be trapped in hell on the high seas? To ask other readers questions about Silks and Sabers, please sign up. all you need to know is: this is happening. i don't have to explain myself to the likes of you. Just read my first book by this author, Moth and Flame , which features Gweneth's sister Renee and her love, Laurent Lavasseur, and really liked it, so now I'd really like to read this one if I ever get the chance.